As a coach, I’m always looking to get more out of my athletes. I constantly stress the fact that working hard with me is not enough. Great athletes don’t limit their efforts to designated practices or training schedules. They take their craft home with them and do more than is expected. In other words, it is not enough to work hard when everyone else is working hard. What are you willing to do while everyone else is resting? I am not naive to the fact that certain athletes have more natural ability than others. I’ve been around long enough to know that some kids just have more raw talent than others. Yet, while nothing can be done to change how you were born, plenty can be done to change who you become. Perhaps the best way to surpass your expectations is by working harder than anyone could ever expect. If you need an example, look no further than Stephen Curry. The brief video below tells his story. 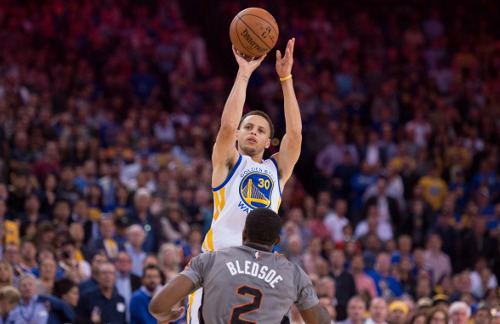 Many people see Stephen Curry today and assume that he had an easy road to the top. After all, his father Dell was a 16-year NBA veteran. Basketball was definitely in the blood. There is much more to Stephen’s success than his last name however. As a youngster, Stephen was often considered the kid who was too small, too kind, and not strong enough. He didn’t overwhelm anyone with his physical attributes or aggressiveness. Even as a high school player with an NBA veteran father, he had a hard time attracting the attention of college recruiters. No power conference schools offered him a scholarship. Once again, he just didn’t have the physical gifts that many thought were necessary to excel. What Stephen did have though was an uncanny work ethic. And perhaps that did come from his father. As a youngster, Dell Curry was also known to spend hours each day mastering his shot. Stephen certainly followed suit, going above and beyond what even his father did. Another reason that I like to use Stephen Curry as an example for my athletes is his willingness to continue working tirelessly despite his success. So many athletes take their foot off the gas once they achieve what they believe to be the top. Stephen Curry is different. In his eyes, he still sees room for improvement. It doesn’t matter that he is already the best shooter in the NBA. He wants to get better and believes that he can. Settling is not part of the equation. Curry continually strives to improve. The work ethic that he had as a child hasn’t wavered one bit. If anything, it has only grown stronger. There’s no more uncertainty. Curry has already witnessed what is possible through relentless work and dedication. Not only are there no signs of him slowing down, there’s virtually no one on the court who can stop him. I always tell my athletes to control what you can control. For instance, you can’t control who you were born, but you can control how hard you work. Stephen Curry is a prime example.Â His work ethic might be unusual, but it’s freely available to all. No one is stopping you from working as hard as him. Unfortunately, most athletes aren’t willing to cash in on that free offer. They might try on occasion, but they lack the physical and mental resolve to remain consistent over time. In summary, although I spend several hours each day teaching a sport, I’ve often thought that my most important job is to improve the work ethic of my athletes. Teaching your athletes to embrace the grind will always be time well spent. Not only will the athletes improve in their sport, but they’ll also take that work ethic with them wherever they go. And seeing an athlete excel beyond the ring or field is perhaps the greatest reward of all. Ross, great article motivation is key. Do u have sport specific articles, like say for basketball? Or suggestion? Yes. It is by choice. Lebron and Magic Johnson say it today. Probably he will be the best basketball player we have ever see.